From the introduction: Shortly prior to the Second World War breaking out, a successful engineering tandem John Carden and Vivian Loyd had left the Vickers-Armstrong company and founded their own company Vivian Loyd & Co. The company presented their design concept of a low-cost multifunction vehicle. The objective was minimizing the production costs and simplification of production process. 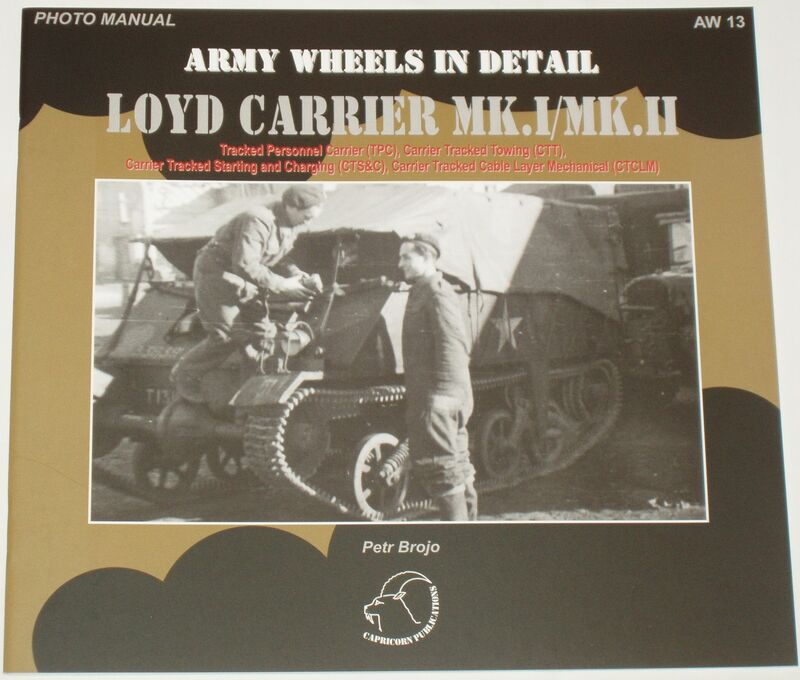 The design of the Loyd Carrier originated from the Fordson 7V 15cw14x2 vehicle. The chassis was reversed so the engine was placed at the rear of the vehicle. The gearbox, radiator, axles and brakes also originated from Fordson 7V. The prototype utilized Horstmann tracks, drive sprockets and suspension units and other components were same as used on the Universal Bren Carrier. Further changes were incorporated during production. The vehicle was originally fitted with Bendix drum brakes, however other manufacturers introduced Girling brakes. This change can be used to define the Mk.1 and Mk.1I versions of the vehicle. The first serial production vehicles were equipped by Ford V8-79E-6004 85hp engines. Further vehicles produced by various manufacturers used the American Ford V8s 90hp and Canadian V8s 85hp engines. The engine was at the rear of the vehicle together with the radiator. The gearbox transferred the drive to the front drive sprockets and subsequently to the tracks. The tracks were controlled by two levers by the drive seated at the front center of the vehicle. The original body design consisted of armor plates up to 6mm in thickness, however provided close to no protection (the upper and rear sections of the vehicle were opened), therefore the vehicles were deployed to areas outside the reach of enemy fire. After the vehicle was fitted with 7mm thick armor plates atthe front and the sides of the vehicle the protection of the crew improved. The crew was protected from weather elements by removable tarp on tubular frame. The prototype was presented to the army at the end of 1939 with the objective to obtain a 200 vehicle contract award. The serial production was launched in February 1940 in Vivian Loyd & Co, however due to further demand the production was also moved to larger companies such as Ford Motor Company and Wolseley Motors, that produced more than 13000 vehicles. Other producers included Dennis Brothers Ltd, Aveling & Barford and Sentinel Waggon Works. The total production reached 26 613 vehicles. The first vehicles were being delivered to combat units in second half of 1940. Initially the vehicles were deployed in Great Britain only and subsequently to other theatres of the war. Loyd Carrier was produced in the following versions: Tracked Personnel Carrier (TPC) The TPC was widely used as infantry and cargo transport and over 1500 vehicles were produced. Carrier Tracked Towing (Cn) Designated to tow the 6pdr. Anti tank canons as well as the 4,2inch mortars. An additional version was also created: Tractor Anti-tank guns Mk.1 that primarily towed the 2pdr. Cannons and provided transport for the crew, ammunition and cannon spare wheel. The side armor from the 2pdr. Cannons were transported affixed to either side of the drive compartment for increased protection. These modifications were used in both British and Canadian army. A total of 15000 vehicles were produced. Carrier Tracked Cable Layer Mechanical (CTCLM) Vehicle designed for the Royal Signals Corps used as mechanical cable laying vehicle. Approximately 300 vehicles were produced. Carrier Tracked Starting and Charging (CTS&C) Tank units technical support vehicle. The vehicle was equipped with 30V and 12V generators for engine starting, battery charging and overall tank support. Approximately 2000 vehicles were produced. There were several experimental vehicles being developed. As examples we can use an anti­aircraft complex equipped by four BREN Machine Guns, self propelled 2pdr. Cannon, self propelled 25pdr. Howitzer, bridge vehicle, armored vehicle and mobile workshop. Loyd Carrier vehicles were also used by the Czechoslovak Independent Armoured Brigade and Polish Armed Forces on the western front. Primarily these were the CTSC vehicles used by the tank battalions and CTTvehicies at infantry and artillery support units. Loyd Carrier vehicles served in many western armies post WWII. Due to lack of spares the vehicles were being gradually decommissioned and served as training vehicles until mid 1960-ties.